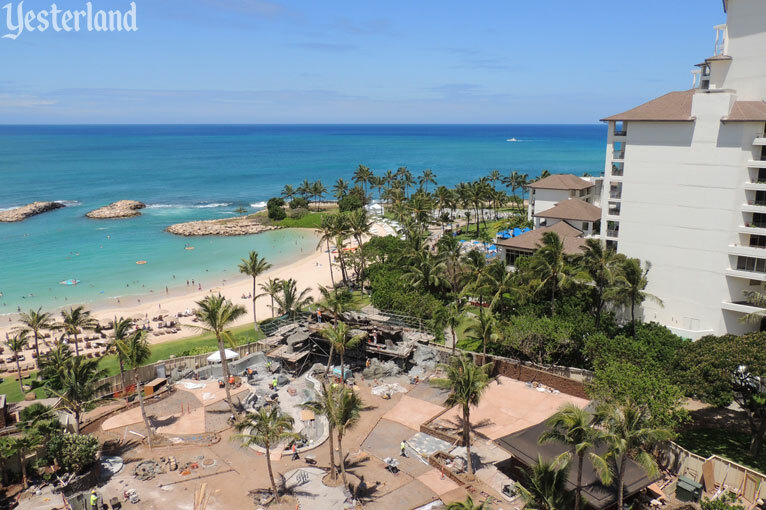 After publishing 22 earlier articles about Aulani—starting when there was just an empty 21-acre lot and the future resort did not yet have a name—I finally stayed at the Disney resort in the Aloha State. My short review: All the great things you’ve heard about Aulani are true. 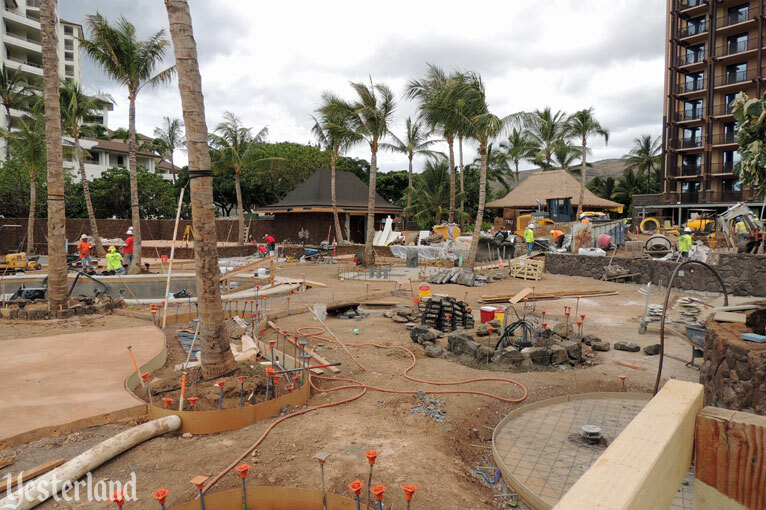 Today’s article takes a look at the current construction at Aulani and what it replaced. 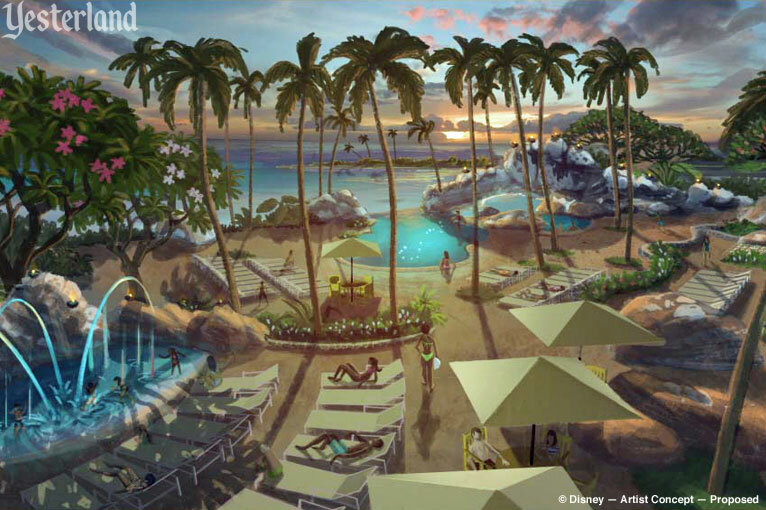 Who would have thought that there would already be a Yester Aulani? Welcome pin or apology pin? 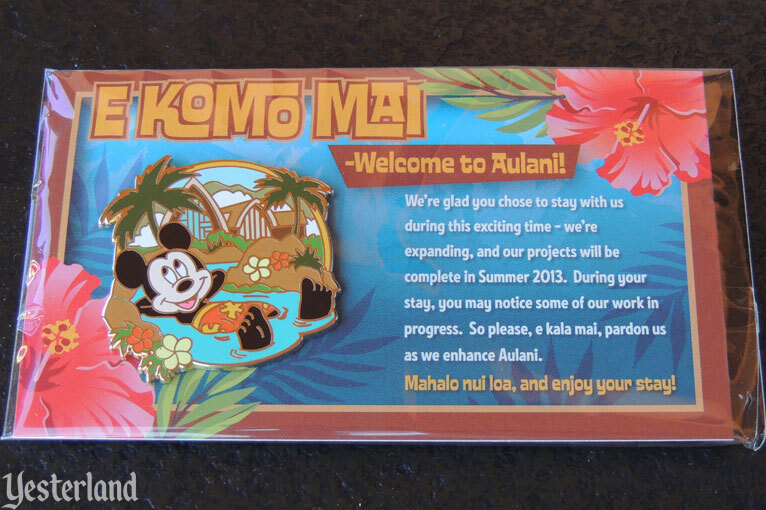 Current Aulani guests are getting a pin on a card when they check in. “We’re glad you chose to stay with us at this exciting time,” the card says. Translation: Sorry. 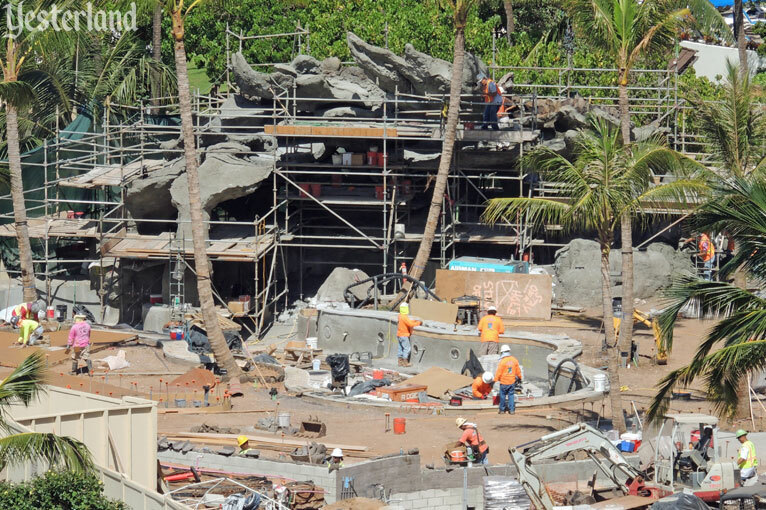 Part of Aulani is a construction zone. Some of the grounds are off limits. Here’s a pin for you. For the vast majority of what Aulani has to offer—especially the Waikolohe Valley, with its Waikolohe Pool, lazy river, slides, whirlpool spas, and Rainbow Reef snorkeling pool—it’s business as usual. 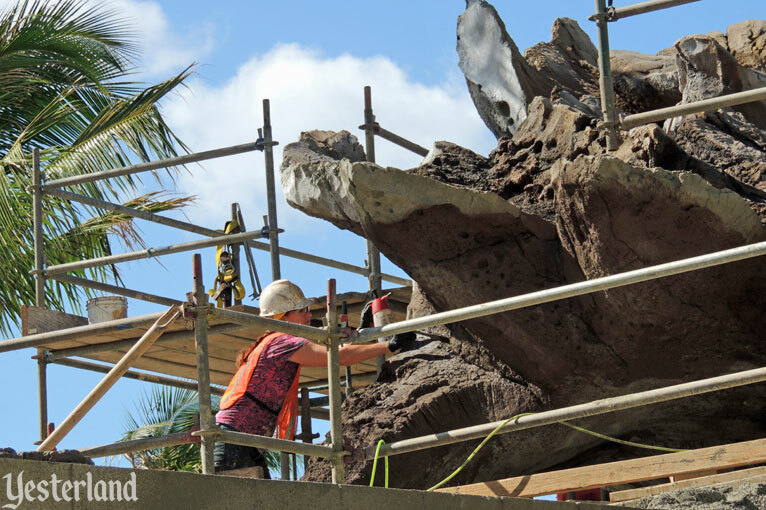 Some features of Aulani have gone to Yester Aulani. 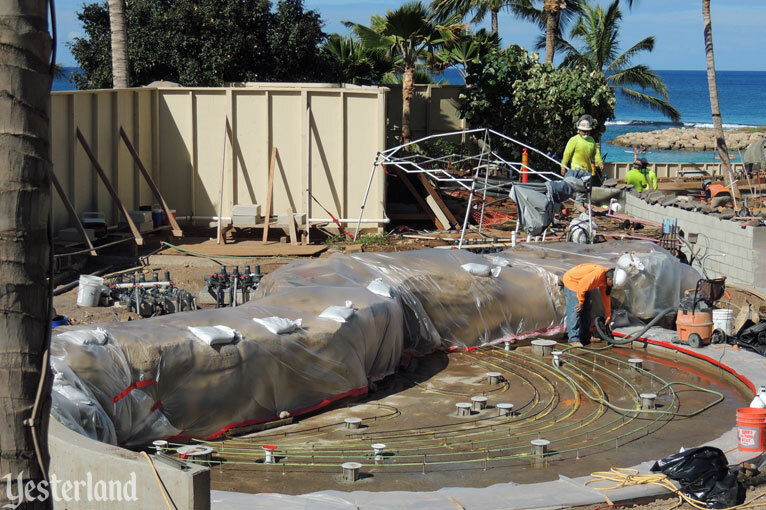 The first Aulani structure to go to Yester Aulani was the temporary model center. The structure opened July 2010 with a sample two-bedroom Disney Vacation Club (DVC) villa and a sample hotel room. Prospective DVC buyers could tour the model villa. 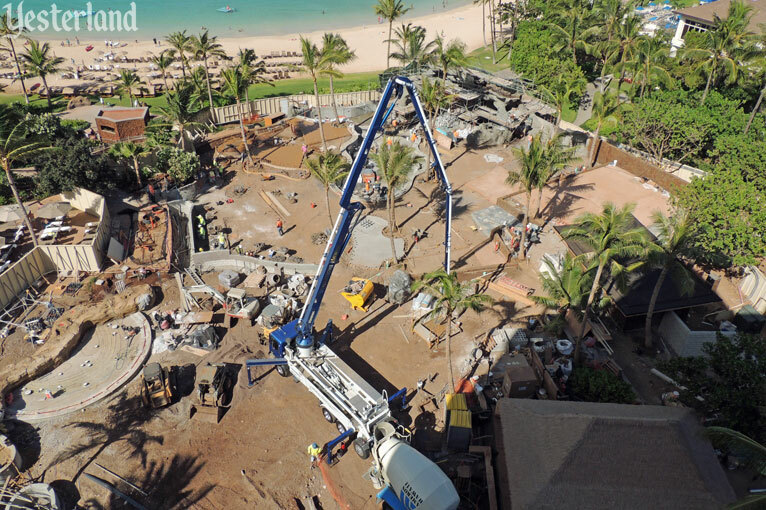 The structure was demolished in February 2011 when it became possible to provide hardhat visits into the actual resort buildings. 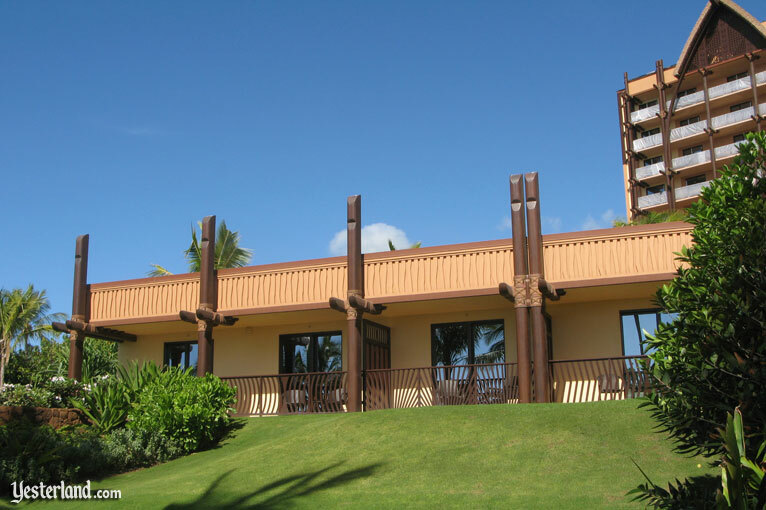 The former location of the model center would become Makaloa Garden, a lawn for weddings and the resort’s Starlit Hui performances. The Makaloa Garden closed in October 2012. 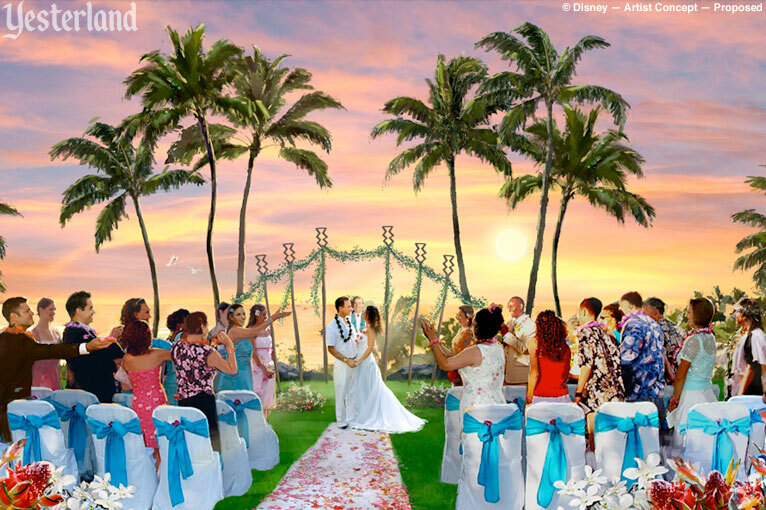 The resort’s Halawai Lawn, which had been a staging area for building construction, became the new location for Starlit Hui and the site for large, outdoor weddings. Adjacent to the Makaloa Garden, the Makai Preserve had provided an opportunity for resort guests to swim with stingrays. It went to Yester Aulani in October 2012. 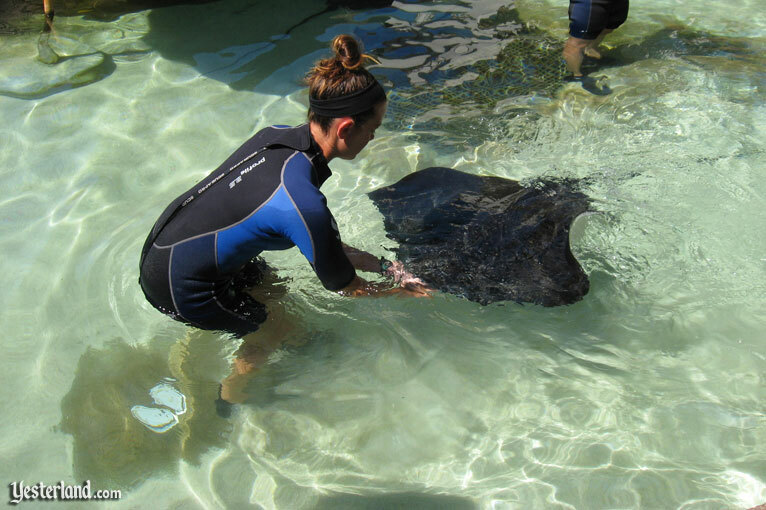 The stingrays were moved to new homes at three aquariums in Hawai‘i. Wailana is a Hawaiian word meaning calm or quiet water. 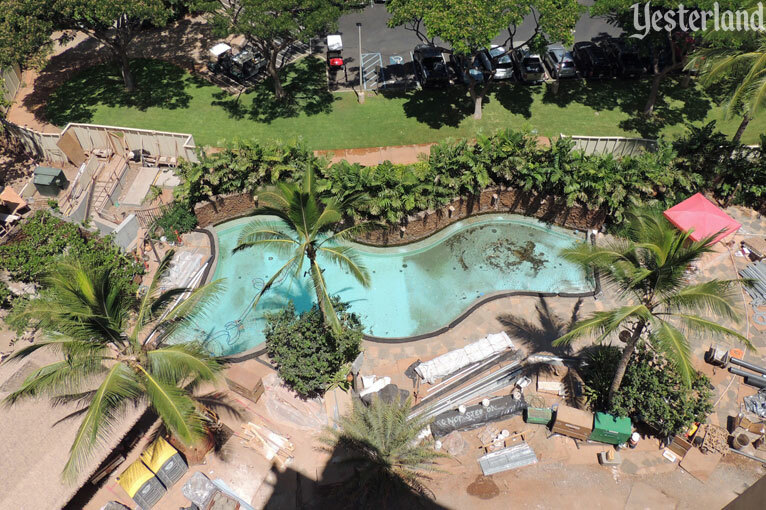 The Wailana Pool was to be an escape for adults. 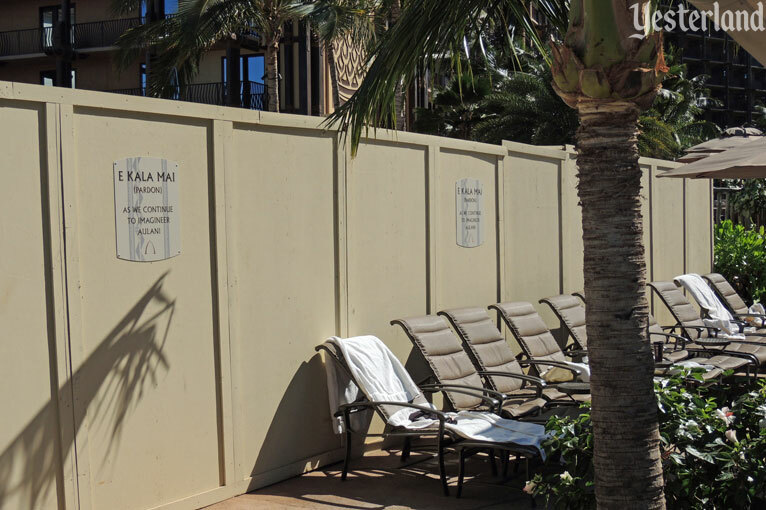 “Separated from the excitement of the main pool area,” the Aulani website explained, “this relaxing retreat beckons you to unwind.” With the popularity of the other pools and deck areas, the Wailana Pool became an overflow rather than a retreat. 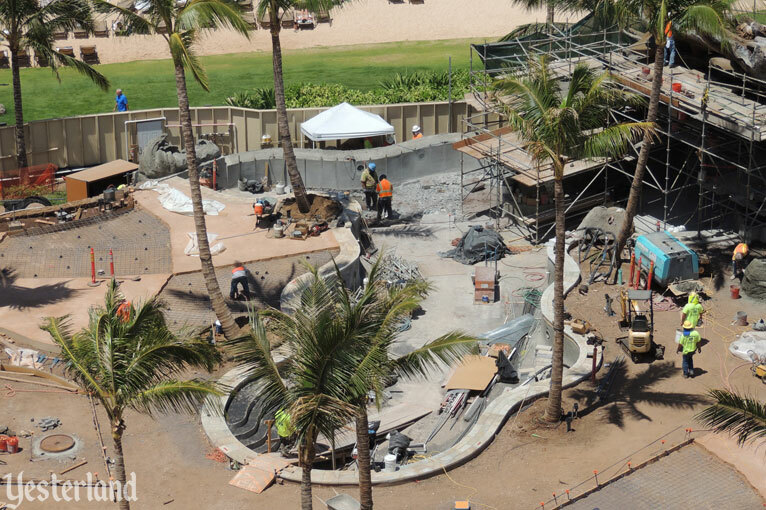 The Wailana Pool closed temporarily around the same time as the Makaloa Garden and Makai Preserve, but will reopen—although reportedly with enforced age restrictions. Perhaps the most unexpected addition to Yester Aulani is the ground-floor DVC Grand Villa at the very end of the Waianae Tower, facing the ocean. It’s been gutted. Disney’s goal is to complete everything in September 2013. The artist’s rendering shows inviting enhancements to Aualni, but it doesn’t do justice to the size of the project. The construction photos in this article are from July 15, 16, and 17, 2013. None of these photos involved entering the construction zone. 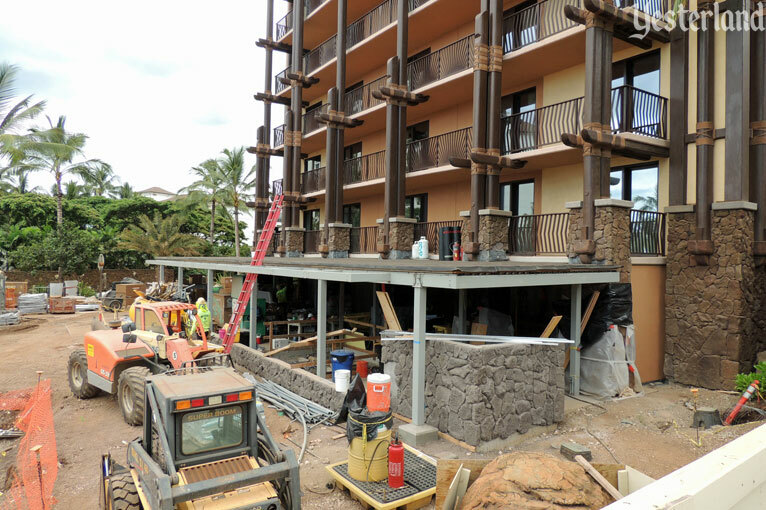 But what does all this construction mean for current guests at Aulani? It’s really not a problem. There’s so much to see and do at Aualni, that it’s easy to ignore the construction.